3 Bedrooms | 3 Full Bathrooms | 1 Half Bathrooms | 2,566 Living SqFt. GULF VIEWS FROM EVERY ROOM! Where the palm trees sway and the Gulf water glistens sits this beautiful beach house with stunning waterfront views. Your own private “treehouse” exudes happiness and joy with a bounty of bright windows and light coastal decor throughout. The tall standing home serves as a great landmark or beacon, letting you know your location after a nice stroll on the beach. With windows lining every wall, this home receives a bounty of natural Sanibel sunlight inside. The open great room is light and bright, with an open and airy atmosphere to compliment the amazing Gulf-front views. Barn doors enclose one large guest room and ensuite bathroom on this level, with a separate powder room located on this floor as well. You may very well find yourself sitting and gazing out at the Gulf all day, with palm fronds swaying and beach walkers passing by. Open the windows and let the cool sea breeze flow through. With views spanning south and west, you'll catch amazing sunsets right from the comfort of our couch! Invite your friends, family, co-workers or neighbors over for dinner or drinks. The open great room has plenty of space for entertaining guests. The home also serves as a great rental property for vacationers visiting Sanibel Island. A spacious kitchen includes granite countertops, tile backsplash, stainless steel appliances and a large pantry for storage. Even the kitchen window facing the street side has a scenic view down Jamaica Drive. The master suite and guest suite occupy the upper level, offering the best views in the home. Your favorite view might just be from the master bathroom shower, or from inside the jetted tub. With a large walk-in closet, sitting area, and sliding glass doors to the outdoor porch you can lounge in your bathrobe all morning if you please! The guest suite features the same great Gulf views with sliding glass doors leading to the porch. Sit outside and sip your morning coffee brewed at the convenient coffee bar just outside the bedroom door, in the pass-way. Each of the three bedrooms include sizable walk-in closets with plenty of space for storage. Stroll down the private footpath to the white sandy beach. 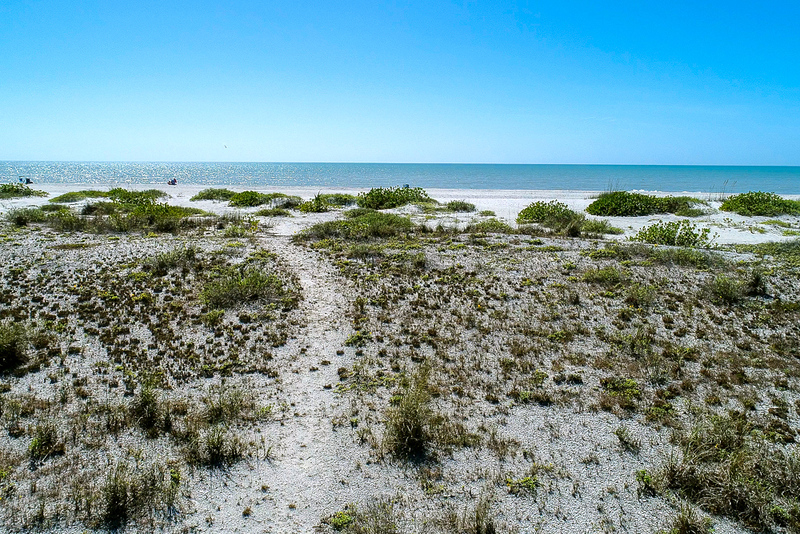 The uncrowded beaches on the quiet west end of the island are what make Sanibel so serene. Stop along the path and admire the seagrass. There are even two lounge chairs for you to take a seat and enjoy the sound of waves. If you don't care to walk down to the beach, you can catch some great sun-rays right from your back yard! Lined with tropical vegetation, the backyard is a private and tranquil spot to kick back and relax. A small garage even has storage for a golf cart and beach gear so you never have to track sand inside!